If you have ever taken a look at the chemicals section of your local gun store and have felt a bit overwhelmed, you are certainly not alone! There is a massive amount of different oils, solvents, CLP, specialty cleaners, foams and aerosols available for purchase, and choosing just one can be very hard. In most cases, you are going to need only a small assortment of various chemicals in order to cover all your bases. Choosing those chemicals, however, can be a bit challenging. If you want to learn how to select the perfect chemical cocktail for your gun cleaning and lubrication needs, keep reading! For starters, we are going to take a look at the very first thing you are going to use in your cleaning regimen: solvent. Solvent is going to be a pretty big subject, especially since it comes in many different forms. There are many different specialized solvents out there, from foaming bore cleaner in an aerosol can, to good ol’ reliable Hoppes #9 in its plain-jane bottle. All of these solvents are essentially designed to do the same thing: dissolve fouling. It’s how they go about doing that where they become different. First, let’s look at your plain, basic solvent. This is probably just going to be a regular, foul-smelling liquid in some kind of bottle with a screw cap. This is going to be a must-have for any gun owner and is one of the very basic staples in any gun cleaning kit. This is used for soaking patches and mops in order to apply the solvent to the bore. I also frequently dip my utility brushes into it to get a little extra cleaning power. When selecting one of these solvents, you will want to pay close attention to what it dissolves. When you fire a gun, there are typically 3 types of contaminants left behind: lead, copper, and carbon. You are going to want to select a cleaner that gets at least 2, but ideally all 3 of these contaminants. Another type of solvent that I like to use is a foaming solvent. These usually come in either an aerosol or pump-type bottle that dispense a light, foamy version of solvent (the consistency is roughly equivalent to foaming hand soap). These are usually a bit more expensive than your regular solvent and are often very close to the same chemicals. The advantage to these, however, is the foaming action. This allows me to accomplish several different tasks that I couldn’t do with regular solvent. For starters, it allows me to “soak” the bore. In especially bad cases, I can fill the bore of my rifle up with foaming solvent, wait a couple minutes, and remove all of the fouling much easier. It is also fantastic for cleaning receivers and other areas where it can be difficult to clean. Simply fill the area up with foam, scrub what you can, and rinse away all the solvent. The final solvent I’m going to discuss here is going to be the aerosol solvent. These are usually very thin liquid solvents inside of a spray can. In fact, I often just use some form of brake cleaner! There are several advantages to this type of solvent. First, it is an actual solvent, which means it will break up and dissolve fouling just the same as any other solvent. Second, since it is pressurized, you can use it as a “pressure washer” of sorts to blast away fouling. This works best for me when I have an area of my firearm that is particularly hard to clean. I usually will soak it in foaming cleaner, scrub away whatever I can, and then use my aerosol solvent to “wash” the part clean. Any solvent that remains quickly evaporates, and leaves you with a nice clean metal part that is ready to be oiled! Oil is another one of those products that can be either very complicated or very simple. If you would like a much more in-depth analysis of oil and grease, I would recommend you check out my “Gun Oil 101” article which will cover these things more thoroughly. For all intents and purposes, however, there are only a few things you need to worry about when it comes to selecting a good gun oil. The first, and probably most important, thing to look for is a petroleum-based oil. These oils are far superior to any vegetable or mineral based oil and are going to serve your lubrication purposes much better. This means you should stay far away from products such as Fireclean and Rem-oil. In fact, I always highly recommend against getting any sort of aerosolized lubricant. I have used my fair share of them in the past, and in my opinion, every single one of them is absolutely terrible. 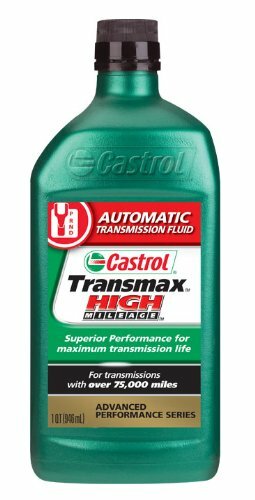 It’s very hard to beat a good old fashioned petroleum lubricant. The second thing to look for is going to be a good boundary lubricant package. Since oil is a liquid, it likes to squeeze out from all of the microscopic hills and valleys in the metal of your firearm. Boundary lubricants are an additive that consists of very tiny, microscopic beads that also happen to be very slippery. Since these tiny beads are solids, they stay where we need them to be much better. Due to the operative nature of firearms, a good boundary lubricant package is going to be an absolute necessity in any gun lubricant. Without a good boundary lubricant package, your oil will be doing virtually nothing, leaving you open to wearing and even premature failure of your components! What is almost more important than what to look for in a good oil, is what to avoid. There are a lot of products out there that appear to be “slippery” at first glance, but are actually terrible and may even harm your firearm! As I have mentioned before, Rem-oil and Fireclean are 2 rather popular options that are terrible lubricants. Going a bit further, WD-40 is horrible for your firearm, and will actually do far more harm than good if used on a regular basis. Any penetrating oil, for that matter, makes an absolutely terrible lubricant. While these products can be used on firearms under the right circumstances, the safest and best thing to do is simply avoid them at all costs. I’m sure you’ve all seen the guy who screams “Why spend $10 on a small bottle of lubricant? Oil is oil!” as he dumps a quart of 5W-30 on his AR-15. While he is indeed correct that “oil is oil,” he is absolutely wrong when it comes to the additives. A firearm has very different needs than a car does, and as such will require a very different additive package. While it is true that any old oil from the auto parts store will work to lubricate your firearm, it certainly will not be optimized for the special conditions encountered when lubricating a firearm. If your budget really is that big of a concern, there are much, much better options out there than motor oil. It certainly won’t do your firearm any harm, but when you demand reliable performance out of your equipment, why settle for anything less than the best just to save a buck? CLP is a generic acronym given to any chemical designed to clean, lubricate, and protect your firearm. CLP is a special combination of chemicals that contain a solvent, a corrosion inhibitor, and a lubricant. At first glance, this looks like everything you could possibly need, all in one nice handy package! However, this is not the case. The hard truth about these products is that while they certainly will clean, lubricate, and protect your firearm, they won’t do it very well. Don’t get me wrong, CLP certainly has its place, but it most definitely is not on the shelf with your gun cleaning chemicals. My can of CLP resides in my range bag, and that is it. I will agree the stuff is fantastic for a quick fix at the range. When my AR-15 starts to jam during a 3 gun match (because let’s be honest here: we all never clean our guns as much as we should) the last thing I want to have to do is detail strip and meticulously clean every tiny individual part, clear out all the mess with solvent, and then re-lubricate with my choice of gun oil. I don’t have the time or the patience to do all of that work while still trying to keep up with the match. CLP is my “emergency quick fix,” and it is very good at that. When I start having troubles with my gear during a match, a good soaking with CLP is usually all it takes to get me back up and running again. Those quick fixes at the range are where CLP really shines, but it is not without its drawbacks. Soaking your rifle in CLP will get you back up and running for the day, but all it does is make your life worse in the long run. While it certainly won’t do any long-term damage to your firearm, the abundance of solvent and oil will cause fouling to build up in places where it normally wouldn’t, which means you’ve got a much bigger chore ahead of you when you get home from the range. It also even acts as an attractant for fouling, and will relatively quickly gum up your action even worse than before! CLP is a truly amazing product and I never go to the range without it. But the fact of the matter is, CLP is just a band-aid to procrastinate on fixing the real problem, and I would never use it to detail clean my firearms. If you’re looking to pick up a single can of chemical that will fulfill all of your needs, then I’ve got some bad news for you. Odds are, if you want to have an effective gun cleaning kit, you are going to need a fair assortment of different chemicals, oils, and greases in order to get the job done correctly. For starters, I usually pick up a good quality bottle of plain old solvent, making sure that it will dissolve lead, carbon, and copper. I also like to have a bottle of foaming solvent, as well as a foaming bore cleaner. I like to round out my solvent collection with an aerosol can of solvent, like brake cleaner. My lubricant collection is much more basic. I like to keep both a good quality petroleum-based oil and a good grease on hand. Even though I advise against using aerosol oils for lubrication, I usually do still like to keep a bottle on hand. I only use this type of oil for giving the outside of my firearm a light protective coating, or other quick or emergency tasks. These are usually low-quality, terrible products, but they can come in handy during a pinch. I like to round out my gun cleaning chemical collection with a bottle of CLP. This bottle rarely leaves my range kit, and I almost never use it at my gun cleaning table. Good old reliable Hoppe’s #9. This product has been a staple of the gun maintenance world for years, and if it ain’t broke, don’t fix it! This stuff was your Grandpa’s favorite gun cleaner, your dad’s favorite gun cleaner, and it should probably be your favorite gun cleaner too! I mean, what’s not to love about this stuff? It’s cheap, effective, and incredibly easy to use. I have just a small bottle, and (as long as you don’t spill it) will last you for years. This stuff cuts through carbon and lead fouling like a hot knife through butter. All you need to do is soak a patch or two in it and go to town. Hoppe’s #9 isn’t without its downfalls though. It has a bit of an issue breaking down copper fouling. Since most bullets nowadays have a copper jacket, this means you’re going to need to do quite a bit of scrubbing in order to get your bore clean. I don’t have any issue with this, however, as I actually rarely use Hoppe’s #9 to clean my bore. Since this stuff really excels at cutting through carbon and lead fouling, I mostly use it in places where carbon likes to build up. My favorite part about this stuff is that since it comes in a nice plain bottle, it is very easy to dispense just a little bit to dip brushes and rags into. This is great for when it comes to scrubbing down dirty bolts or getting into tight spots in your receiver or chamber area. In fact, on several occasions, I’ve just submerged entire small parts in a bit of Hoppe’s #9! The fact of the matter is, if you don’t have a bottle of Hoppe’s #9 on your shelf, then you need to get one there. If you are looking for some of the best solvents that money can buy, then look no further than Hoppe’s Elite. This is another fantastic (albeit pricey) product from Hoppe’s. This solvent goes a step further than the #9 formula and also dissolves copper fouling as well. This particular product also comes in a spray bottle (manual pump, not aerosol) to make cleaning hard to reach areas and soaking patches even more convenient. This is my personal favorite gun cleaner and is a product that you really can’t live without. The only downside to Hoppe’s Elite is the price. It is a bit more expensive than most other options and comes in a very small bottle that doesn’t last very long. Because of this, I really like to use it in conjunction with a lot of the cheaper and more plentiful solvents. This allows me to stretch my bottles of Hoppe’s Elite and make them last a little longer. To put it simply though, the name of this product really does say it all. This is the most “Elite” gun cleaner that money can buy. If you want the best solvent that is on the market today, then look no further than Hoppe’s Elite. If you’ve never used a foaming gun cleaner before, then you are certainly in for a treat. Now, I know what you’re thinking. “But Dan, I already bought the Hoppe’s Elite spray bottle, do I really need the Hoppe’s Elite foaming cleaner?” The answer to that is a resounding yes! While they are very similar chemical-wise, my bottle of foaming cleaner serves an entirely different purpose. While the regular bottle of Hoppe’s Elite produces a fine mist every time you spray it, the foaming gun cleaner produces a thick, foaming, mousse-like cloud of crud-busting solvent. This fits an entirely different niche in my cleaning regimen. The foam penetrates deep into hard to reach areas and sticks around to really soak through and dissolve all of the junk that builds up in your firearm. This stuff is my go-to for receivers. I simply fill the whole thing with foam, wait a minute or two, then scrub everything I can with a wire brush. After that, all that’s left is to blast everything away and re-oil. Obviously, this is going to be one of the most expensive chemicals on your cleaning shelf. Not only are you starting with the already expensive Hoppe’s Elite solvent, but you are adding all of the chemicals and mechanical pump components to make it foam upon dispensing. All of this stuff doesn’t come cheap, but it also puts this gun cleaner in a class all its own. Foaming gun cleaners are relatively new to the market, and as such haven’t caught on quite like I believe they should. One thing is for sure, once you try a foaming gun cleaner, you will wonder how you ever lived without one. If you are looking for the best foaming gun cleaner that you can get, then Hoppe’s Elite foaming gun cleaner is a perfect place to start. If you are looking for a great foaming bore cleaner, then this formula from Gunslick is a great product to consider. 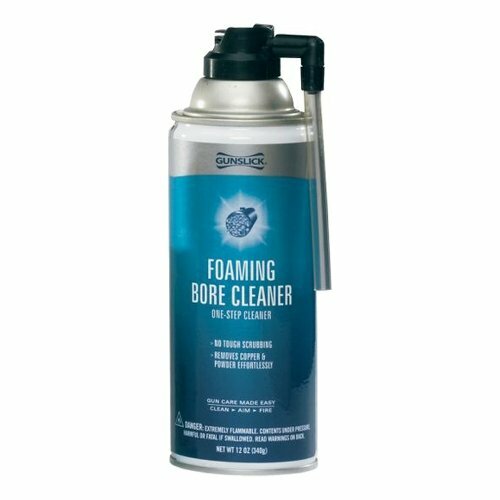 This cleaner produces a thick, robust foam that easily penetrates all the way down your bore. It also dissolves carbon, lead, and copper to make sure that your bore gets as clean as possible. This is advertised as a “one-step cleaning system,” but this is a tad bit misleading. In my personal experience, the bore has always benefited by a bit of scrubbing. Usually, only a single pass or two with a bronze brush is all it takes to break everything free. The main benefit to this foaming bore cleaner over other plain foaming cleaners is the application method. This is an aerosol bottle, which means that depressing the trigger uses pressure to create the foam and shoot it out of the tip. The application tip is also much different than other foaming cleaners. It consists of a clear plastic tube that will fit very conveniently inside almost any barrel. This allows you to really shoot the foam down and get a good coating on even the longest barrels. This is far more effective and convenient than trying to use a regular pump spray bottle to get foam in your barrel. If you’re tired of spending hours scrubbing your barrel and want a quicker, easier, more effective method, then I’d consider this foaming bore cleaner from Gunslick. 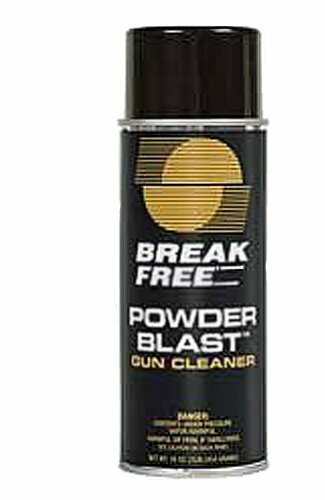 Break-Free Powder Blast is my favorite blasting cleaner. “Blasting” is the name I give to solvents that don’t work very well in and of themselves, but they are very runny, and have a powerful aerosol behind them that shoots them out with greater than average force. I usually don’t use these for general gun cleaning, but they do have a very specific purpose: cleaning areas that are impossible to reach. In just about any firearm, there are going to be areas that are either difficult or impossible to soak with solvent, scrub and then dry with a rag. For those areas, Break-Free powder blast is the perfect tool for the job. After a good soak and scrub with foaming gun cleaner and a wire brush, many things like fire control groups and intricate clockwork stuck deep in your receiver has no way to get rid of all the carbon-soaked fouling. This is where the powder blast comes in handy. Continue to soak that baby down in this stuff until it runs out clear. The incredibly viscous liquid, mild solvent, and powerful spray all combine to flush out all of the nasty, fouling soaked foaming cleaner. Once all the gunk is out of there, any remaining powder blast cleaner quickly evaporates, leaving behind a shiny clean surface ready to be oiled! If you frequently struggle to clean many of the hard to reach components of your firearm, adding some Break-Free powder blast to your arsenal may just do the trick. If you are on a shoestring budget and trying to pinch pennies wherever you can, then your best bet is going with something that is not a specialized gun cleaner. Many of these chemicals are almost identical, but when you place it in a different package they are much cheaper. Your basic can of standard brake cleaner is one of those things. These chemicals are designed to do roughly the same thing as gun cleaners are, which makes them very similar. They don’t work nearly as well, but they will certainly get the job done. And at only a fraction of the price, it makes them very affordable. This brake cleaner from CRC is my go-to when it comes to a cheap solvent. While I occasionally use it on my guns, it’s also a fantastic around-the-garage solvent. This stuff is great for cleaning everything from guns to tools, to, well, brakes! This stuff is so cheap I like to keep several cans of it lying around in different places, so I’ve always got some handy. The main thing to consider with this is that it is very powerful and very fumey. I would avoid using it indoors or even in any poorly ventilated area at all costs. If you are on a tight budget or just looking for a cleaner that can do more than just clean your guns, then I’d start with this brake parts cleaner from CRC. If you’re looking for the best bottle of CLP you can get to keep in your emergency range bag, then this CLP from Safariland is a great place to start. The fact of the matter is, not all CLP is created equal. There are many products who claim to do all three whose performance is lackluster and will leave your gun dirty and unlubricated. This product is not one of those. The aerosol is just powerful enough to penetrate into hard to reach areas, but not so strong that it makes a huge mess. It also has a very light foaming action which allows it to work into hard to reach areas. If you’re looking for a product that will be the be-all, end-all to clean, lubricate, and protect your firearm all by itself, then you are in the wrong market. While CLP does claim to do all of those things, it doesn’t do them very well. CLP should be used with extreme caution, and only in emergencies, as in my opinion, it only makes things worse for you in the long run. That being said, when my AR-15 goes down during a 3 gun match, this is the stuff I trust to get me back up and running again. If you are looking for a great bottle of emergency gun cleaner and lubricant, then this will be a good product to put in your range bag. If you are looking for the best-specialized gun oil money can buy, then look no further than the M-Pro 7 LPX gun oil. I use this stuff on everything from my .22 LR handgun to my .338 Lapua rifle, and everything in between. Unfortunately, the manufacturer is not very specific about the boundary lubricants or other additives used in this oil, but I can tell you one thing: it works. Very well. This oil has good migration to reach the areas that are hard to get and resists oxidation and corrosion very well. In fact, I have hundreds upon hundreds of rounds through my firearms without relubricating with this oil. Truth be told, my only complaint about this oil is in the bottle. The cap likes to leak a little bit, and the “precision applicator tip” is neither precision nor easy to use. It often requires the use of a paper clip or other small hook in order to get the tip open. Once it’s open, however, it dispenses some of the best liquid that you will ever put on your gun. This is the stuff that I trust to lubricate my firearms every day, and I would highly recommend it to anybody. If you couldn’t tell by the brands of many of the other products on this list, Hoppe’s produces some very high-quality products that are fantastic for your guns. This grease is certainly no exception. A good quality grease is essential to any gun cleaning kit, and this is a good one to add. While this grease is designed more for protecting your guns from long-term storage, it also works very well as a lubricant. A little certainly goes a long way with this grease, and this tiny tube will last you a long time for sure. This grease is not without its downfalls, however. For starters, it is not very temperature stable. Even just a little heat is enough to increase the viscosity and really soften it up. This is not always a bad thing, but it can cause you issues if you use too much to grease your action. Since it is designed more for longer-term rust prevention, it isn’t the best grease you can get. But it is affordable, has good protection, and will certainly lubricate your firearms very well. Most gun-owners have a very negative connotation associated with the acronym “ATF,” but in this case, it’s a very good thing! Most people don’t know this, but ATF actually makes a fantastic cheap gun oil. ATF has a very good corrosion and oxidation resistance, as well as a fantastic boundary lubrication package. It’s detergent additives also help your firearm run a little cleaner. Out of all the oils you can choose from your auto parts store, good old ATF is absolutely the best you can get. This begs the question, is ATF just as good as regular gun oil? Absolutely not. For starters, it is mildly toxic, which isn’t a great thing to have on a firearm that operates right next to your body. The dye they use in ATF to differentiate it from regular oil also has a tendency to stain and leave marks. This will probably not replace your favorite gun oil, but it is certainly miles ahead of your dad’s quart of 5w-30 that’s been in the garage for ages. If you are looking for a fairly decent gun oil without spending a bunch of money, this quart of ATF from Castrol is a great place to start. Let’s face it: if you want to keep your guns clean and running properly, you are going to need a whole arsenal of cleaning chemicals and lubricants. The fact of the matter is, any gun owner worth his salt is going to have quite the collection of chemicals, and use almost all of them on a regular basis. In fact, I personally own and use every product listed here on a very regular basis. I would highly recommend that you purchase every product on this list to ensure that you get your firearms cleaned and lubricated properly. However, if I had to choose just one single product that has done the most to help bolster my gun cleaning routine, it would have to be Hoppe’s Elite foaming gun cleaner. This stuff is not only a fantastic cleaner, but the addition of a foaming cleaner to my arsenal has allowed me to clean my firearms so much better. One thing is for certain, you will absolutely not regret purchasing the Hoppe’s elite foaming gun cleaner. So now that you have all the information you need, you can go out and re-stock your cleaning supplies with the best chemicals you need today!